In many parts of the world canyons and rivers are major barriers to medical care, education, trade and cultural development. 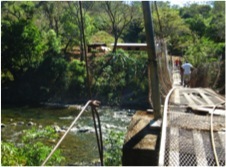 In the late 1980’s a Clarksville, Tennessee UMVIM team, led by Glenn Abernathy, built a pedestrian suspension bridge across the San Juan River in the mountains of western Panama between the road-accessible community of Cienaguita and the isolated Ngobe Indian village of Protrera Palma. The bridge offered safe transit across the swollen river during the rainy season and connection to the outside world. It also opened the Ngobe area to a Panamanian Methodist outreach project that is still active today. I was part of an Auburn UMC (AUMC), Alabama team that crossed this bridge in 1991 on a visit with Bishop Morales to Protrera Palma. In 1992, at the request of Bishop Morales, an AUMC team traveled 8 hours from Panama City, 4 hours on a 4-WD road, then a 4-hour hike into the Ngobe village of Boca de Balsa to re-build two pedestrian bridges that were in disrepair and dangerous to cross. After two weeks of work, the bridges were in top shape. Fast forward 16 years. While preparing to build a bridge in Quesimpuco, Bolivia in 2008, we were training with Bridges to Prosperity (www.bridgestoprosperity.org) in Honduras. We met a Peace Corps volunteer who worked in Soloy, Panama near Boca de Balsa—he was touring Central American as his two-year assignment came to an end. When he returned to Panama, he hiked into Boca de Balsa and sent me digital images of the bridges we had repaired in 1992. One bridge had been destroyed and rebuilt by the government; the other was still in use, but needed some repair. 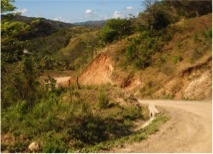 I planned to visit the site during an AUMC mission trip to Cienaguita in July 2010 to assess potential repairs. A major flood had destroyed the Cienaguita/Protrera Palma bridge in 2008, leaving this portion of the Ngobe Indian Reservation isolated again. Covenant UMC, Dothan, Alabama and Rotary International are raising funds to re-build this bridge. A new bridge has been designed and plans are to start construction in summer, 2011 if the balance of the $60,000 needed for materials and labor can be obtained. Due to high water during the July rainy season, I was unable to visit Boca de Balsa, so Eric Sipes and I returned to Cienaguita during the dry season in February 2011 to survey the Cienaguita bridge site, meet with Rotary Club supporters in David, Panama and make the trip into Boca de Balsa to assess the damaged bridge. There is now a paved road to Soloy (about half way in) and a new road being built from Soloy to Boca de Balsa, so the trip now only took one hour from the Pan American Highway, rather than 8 hours. We found that this bridge had also been badly damaged in 2008, after the Peace Corps volunteer’s visit. The bridge’s floor cables were broken and portions of the steel and expanded metal decking torn by a large tree carried down the raging Balsa River. As we were assessing the bridge with Rhett Thompson, a 25-year veteran GBGM missionary in Panama, he overheard a young man at a small store located at one end of the bridge talking about the bridge (God works in mysterious ways). He was the chairman of the “bridge committee.” Committee members were primarily local fathers with children who had to cross the bridge to attend school. The committee had debated closing or dropping the damaged bridge (cutting the cables), hoping to force the Panamanian government to rebuild it. The new government, however, is not particularly sensitive to indigenous needs, so the committee had decided to ask everyone who crossed the bridge to pay a “toll.” We were shown a notebook where over a 4-5 month period they had recorded their collection of $204 (mostly 25¢-50¢ at a time). They were going to purchase wood and a few other items to temporarily repair the bridge to make it safer for their children. One young girl had fallen through a hole in the bridge, but her little dress caught on a piece of the torn metal floor. Someone was able to pull her to safety, but the fathers did not want their children crossing the damaged bridge. We matched their $200 collection and also offered the committee that AUMC would help raise money to completely refurbish the bridge. They could either do the work themselves or AUMC would send a team the next dry season to work with them to refurbish the bridge. The latest word from the bridge committee is that they want to completely refurbish the bridge with our help. We are beginning to plan a team’s return to Panama in January or February, 2012 to work with the community to repair the bridge and make it safe again to cross the river. The road to Boca de Balsa is both a blessing, giving easier access for the villagers to the outside world (and us to them), but also a curse, as the government has plans to build numerous hydroelectric dams in the Ngobe Reservation (the Ngobes will not receive electricity). There were also plans to open the reservation to strip mining for copper. This mining could pollute the many streams in the reservation and destroy the Ngobe’s way of life. There were numerous large demonstrations by the Ngobes across western Panama in February, with several people, including children, hurt by Panamanian police trying to suppress the demonstrations. The president of Panama may be backing down on the strip mining, but as is true across the world, the needs and desires of indigenous people are often ignored in government policy making. We often talk about “building bridges” through mission work. We know that the “ministry of presence” opens doors to not only help those in need, but also to show the love of Christ and “bridge” cultures. There are countless locations throughout the world that need not only the metaphorical bridge, but also a real and functional bridge. Bridges give children access to education, villagers access to medical care and commerce and offers the opportunity for Christians to share our love. Building bridges, figuratively and literally, is at the heart of UMVIM. Ngobe woman and children sitting on remains for bridge tower on San Juan River. 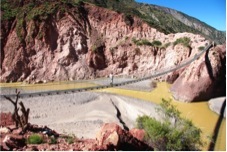 Bridge completed in 2008 across the Chyanta River, 3000 ft. below Quesimpuco, Bolivia.